Sutton Coldfield in 1845 was described as mainly agricultural, a not very important place with little trade. Sutton had doubled in population, however, in the previous hundred years, and the enclosure of the commons in the 1820s had increased the area of farmland from 7,000 acres to 10,000 acres. Demand for agricultural produce was steadily increasing over the hundred years since the 1740s, as the industrial revolution gathered pace, and the growing army of factory workers in the industrial towns consumed ever-increasing supplies of bread. Higher production of grain in Sutton and increased demand for flour meant more work for the corn mills. The principlal corn mill in Sutton at the time was New Hall Mill, owned by the Chadwicks of New Hall, who rented out the mill on 21-year leases. In 1720 the miller at New Hall Mill was Samuel Twamley, and he was followed by successive generations of William Twamleys until the fouth William Twamley died in about 1830. The mill already had four pairs of millstones in 1720, but more efficient ways of operating were continually being introduces, and the Twamleys upgraded the mill on their own initiative as necessary. This process of improving efficiency continued under the next tenants, William Dutton and his sons Thomas and Joseph, who employed three journeymen millers to keep production going round the clock an keep pace with growing demand. The future looked bright for the mill, and a new lease in 1861 specified that the Duttons spend £760 renewing and upgrading the machinery in anticipation of continued growth and increasing profitablility. But already in 1861 country watermills were under threat. One development that was slowly gaining ground was the use of steam engines to power mills - in 1786 London’s first steam mill was erected where two fifty-horsepower engines drove twenty pairs of millstones. Another change came in 1846 with the repeal of the Corn Laws which had put a high levy on imported wheat to protect the home grown crop. The resulting influx of cheap imported wheat was mostly ground into flour at new mills near the ports where the grain ships docked, but there was still high demand for home-grown wheat - the farmers may have had to endure lower prices, but the millers continued to prosper. 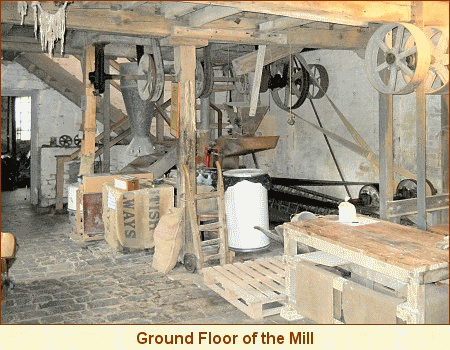 By the end of the nineteenth century almost all the bread flour produced was made from the hard wheat from the Canadian prairies using steam-powered rolling mills, but New Hall Mill struggled on. A hundred years ago it was still grinding grain from local farms using the machinery which is still in place. Recently the Friends of New Hall Mill have been operating the mill, grinding grain from local farms by the traditional method; there are three more days this year when readers can go and see the mill at work, Sunday August 10th, Monday August 25th and Sunday September 14th. Inside New Hall Mill today.